Veterans Day is Sunday and what better way to honor America's heroes than telling them where they can get some free, discounted stuff? Here's a list of national, local businesses offering up deals for current military personnel and veterans for Veterans Day 2018. LITTLE ROCK, Ark. (KTHV) - Businesses are saluting veterans and active-duty military personnel this weekend. Academy Sports: Military members can enjoy 10% off both in-store and online at Academy Sports between Oct. 31- Nov. 11. To redeem on Academy.com, verify your military status using the Troop ID button in the shopping cart, then paste the promo code into the promo code box at checkout. In store, either present your military ID at checkout or verify your military status ahead of time online and print the page asserting your military status. Applebee's: Free meals for veterans and active-duty military on Veterans Day is an Applebee's tradition. This year, those who have served get a free full-sized entree on Nov. 11. The eight options for this year's free meal are the classic bacon cheeseburger, a 6-ounce USDA select top sirloin dinner, chicken tenders platter, double crunch shrimp, fiesta lime chicken, Oriental grilled chicken salad, Oriental chicken salad and three-cheese chicken penne. Bar Louie: During operating hours on Nov. 11, veterans and active military can get a free burger or flatbread, up to a $15 value. Plus, from Nov. 5 to Nov. 12, Bar Louie will allow diners to donate via an add-on to their checks to Operation Homefront, a nonprofit that provides support for military families. Blaze Fast-Fire’d Pizza: $5 build-your-own pizzas to any veteran or active military personnel on Monday, November 12. Buffalo Wild Wings: Veterans and active-duty service members can get a free small order of boneless or traditional wings and fries on Veterans Day. This offer is available at participating locations only, so be sure to call ahead. Cracker Barrel: On Nov. 11, veterans can choose between a free slice of Double Chocolate Fudge Coca-Cola Cake or a specialty coffee beverage. Cracker Barrel's specialty coffee drinks include the Goo Goo Cluster latte, mochas, lattes and vanilla lattes. This promo is offered at all Cracker Barrel Old Country Store locations nationwide. Dollar General: 11% discount for vets and families. Dunkin Donuts: Veterans and active duty military are eligible to receive a free donut of their choice with no purchase necessary on November 11. Additionally, fans may submit the name of an active duty service member online, and enter them for a chance to win a case of the brand's ground Original Blend Coffee. Goodyear Auto Service: Free tire, brake and battery checks from Nov. 9 to 11 to all veterans and active military. They are also offering $250 off all tire purchases by veterans and active military. First responders can also take advantage of these offers. Golden Corral: Veterans and active military can get a free dinner at Golden Corral on Military Appreciation night between 5 p.m. and 9 p.m. on Nov. 12. Great Clips: Visit great clips salon on Nov. 11 and receive a free haircut that day or the free haircut card to use by Dec. 31, or purchase a haircut on Nov. 11 and get a free card to give to a veteran you know. 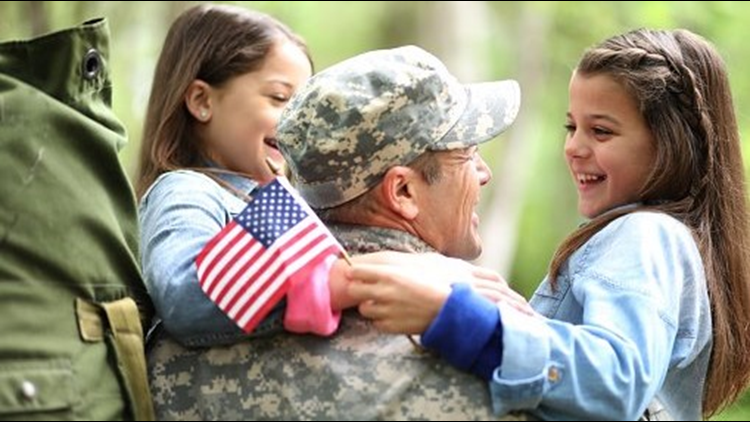 Home Depot: All active duty personnel, reservists, retired military, veterans and their families (with an ID card), get 10% off in-store purchases on Veterans Day. Lowe's: 10 percent off for veterans and families during all military holidays. On The Border: The Mexican food chain will give active and former military members a free Create-Your-Own-Combo 2 Meal on Nov. 11. The combo lets you choose any two items from the combo menu, which includes tacos, enchiladas and empanadas. The meal is served with rice, beans and endless chips and salsa. Red Lobster: On Nov. 11 and 12, Red Lobster is offering a free appetizer or dessert to all veterans, active military and reservists with a valid military ID. Choose sweet chili shrimp or mozzarella cheese sticks, or try a dessert like key lime pie or chocolate wave. Red Robin: Get a free Tavern Double Burger with Bottomless Steak Fries with a military ID on Nov. 11. Ruby Tuesday: All military personnel with valid military ID can get a free appetizer of up to a $10 value on Nov. 11. Options include Bangin' Shrimp, loaded potato chips, BBQ pork meatballs, mozzarella sticks and more. Starbucks: buy one, get one free holiday drinks from 2-5 p.m. Nov. 9-13. State and national parks: Free entry for everyone. Target: Register for 10 percent off entire purchase coupon through Saturday, register online. Texas Roadhouse: Get a free lunch from a select menu on November 11 from 11 a.m. to 2 p.m. Under Armour: From Nov. 5-12, Under Armour is increasing its military discount from 10% to 15%. Military customers can apply this discount online after they verify their military status with Troop ID. Just click the red Troop ID button when you head to checkout to start the process.